Interview #7 features Ana from Brazil who is new to GMing and likes to terrorize her boyfriend. Since I GM everyday, my biggest problem is that I always need to think about new plots, quests, bad guys and interesting NPCs. If a PC dies, the player can think of another character, then a whole new adventure has to be created. It´s also frustrating when I think of an adventure believing it´s going to be great and the thing just doesn´t work in-game. Interested players, chips and good humor. Also, no interruptions. Ana Cláudia, a 27 y.o. Brazilian GM. Blame my boyfriend; he created a monster. He kept telling me for years how D&D was a great game. One day, he told me about Faluzure and it just hit me. I needed to give it a try. I started as a player. Then, I got addicted to it. When I felt comfortable with the system I started GMing, without planning anything. In a good way: I wasn´t an imaginative person before it, and as a GM I´m kinda forced to be. And I have Bipolar Disorder. I´ve tried to kill myself many times. Creating things keeps my mind away from suicidal thoughts. I´d dare to say, it saved my life. I study Pedagogy in college, and I plan to write my paper about RPG and education. In a bad way: In Brazil there was a crime years ago. A girl was killed, and searching the student´s house she lived in, police found RPGs books (I think it was Call of Cthullu). The owner of the books wasn´t the assassin. But every newspaper would tell people that RPGs are evil and players are all devil worshippers, with ceremonies guided by a GM. RPG players and GMs became a little like outcasts. There´s still a lot of prejudice. Everyday. It used to be on weekends and few weeknights because of college and work, but I´m not working/studying now because of an eye surgery. So, lots of fun! It starts at 4:00 p.m., and ends at 10:30 p.m. Sometimes I don´t feel like GMing, so my boyfriend GMs. We play on a plaza downtown. We used to play in my place all night long, but not anymore. We (me and my boyfriend) have a world of our own. We created everything, from NPCs to geography, from magic items to history. We´re very proud of it, and we´re always creating new things. I don´t believe it´s a good thing to always follow what books say, because there are a lot things that could be improved and created. It´s a game of imagination, more than anything else. Again, my own. Same reason above. Some drawings, and foreign languages dictionaries to name places and NPCs. It´s a good idea to visit a museum. Pictures I took when I lived in Norway and pictures from my family´s farm for terrain ideas. And medieval movies. There´s always something new to learn about how medieval people behave. What electronic GM aides do you use? I use Dundjinni to build temples, dungeons and taverns, but the maps are only for myself so I can have a picture of what I´ll describe as a GM. What player handouts do you offer? I don´t. But I´m planning to order some coins from Campaign Coins to spice things up. A: Right now it´s me GMing and my boyfriend playing. And I like it. Until last week we had another player, but his character died. There´s a never-ending will to save villages and unprotected people, and sometimes, teach a craft to local children. I do allow characters to take time to do that. Sometimes Victor just can´t get the evil plans of the enemy, so he´s always in some kind of trouble. And he roleplays very good. If he´s playing a fighter, a talking animal will just scare the hell out of him. If he fails on a Spot check, he will roleplay how surprised his character is with what will happen next. I love the roleplaying of NPCs. I just love to give each one of them a personality, to the point it´s sad when one of them gets killed. Also, I´m an evil GM when it comes to plots. 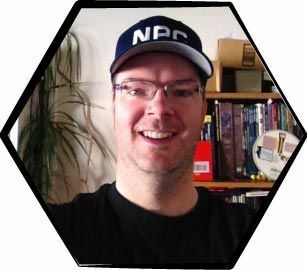 While Victor asks for Gygax´s help, I always ask for Monte Cook´s blessing (yeah, I know the guy is alive) when I´m rolling dice for evil NPCs. He´s the guy of The Book Of Vile Darkness, so he is supposed to help, right? Right? Psychological horror (bwahahahaha). No, just kidding. It´s the roleplaying of NPCs. Being good on that keeps the players interested, and makes their characters willing to die to save villages, cities or even the world. And that´s when things start to happen. My advice is read, read and read. I love Tolkien, but I do read a lot about psychology, and even psychiatry, so I can come up with more realistic NPCs, and think exactly how they would think, if they were real. I read the books to find monsters that´ll match the adventure I´m planning, or I just create a monster myself. I develop the villains and adventures in advance, so I always have a quest and at least two side quests ready to go. Tolkien books. When I first put a dragon on an adventure, I read The Hobbit again, especially when it comes to Smaug, so I could have an idea on how a dragon would act. I also like the Atlas of World History. Software to store important events of the game world, to build a timeline. A way to always keep the story interesting, and a way to make all battles unforgettable. I always have a terrible time when there´s a battle against an important NPC, because I always feel the need to impress and wow the player.